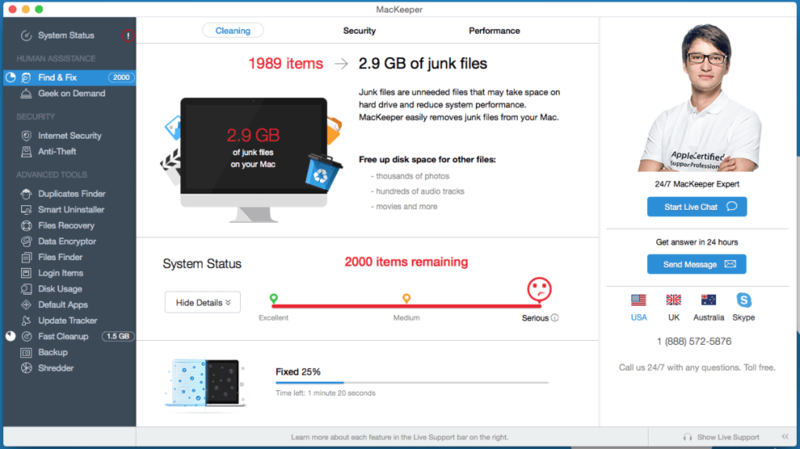 MacKeeper is a professional-grade software application designed to speed up the existing performance of the Mac operating system. Providing both online and offline features, the advanced utilities and tools here represent excellent amenities for users who may be struggling with ongoing performance issues. A handy antivirus and anti-adware package is included at no extra cost. 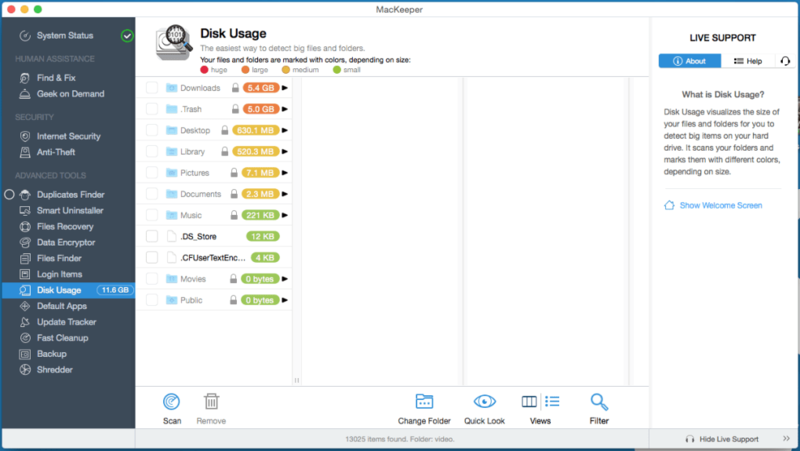 The quick-clean disk utility rapidly identifies and helps to clean up any performance issues. A secure VPN comes standard. Users can track the location of their computer if it is lost or stolen. A number of flexible pricing plans are available. As files are located across several different folders, uninstalling this program sometimes can be difficult. Independent tests have shown that this bundle lags in terms of effective malware protection. 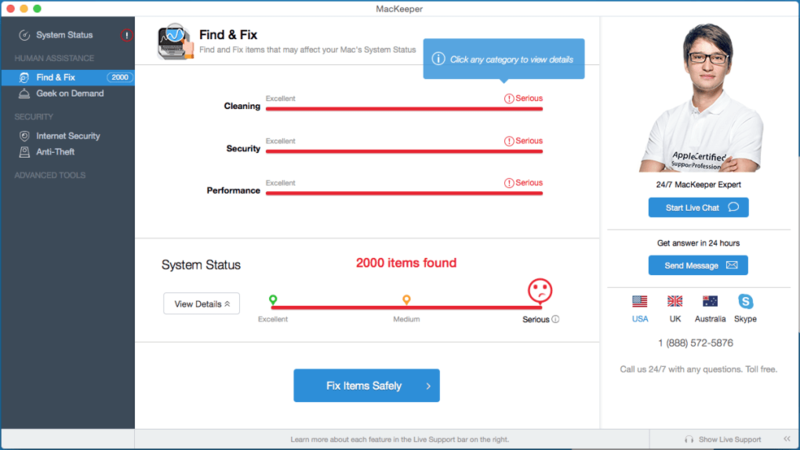 MacKeeper is primarily intended to identify and rectify any programs that might be adversely impacting the performance of an operating system. Another interesting feature is that this program can alert users to applications that are never used or otherwise needlessly obtrusive. The same holds true for extensions, widgets, and browser plugins. A recent update allows users to delete memory-laden email attachments—ideal for business purposes. Furthermore, MacKeeper includes an anti-virus bundle as a standard feature. Encryption issues and similar threats are therefore less of an ongoing concern. Finally, with MacKeeper you can easily and permanently delete unwanted files. Known as the "Shredder," this tool is helpful when a specific piece of data is no longer required. Please note that there is no possibility to recover a file that has been deleted this way. Developed by Kromtech Alliance, the utilities and tools found within MacKeeper have been configured for users with little experience using Mac utilities. A menu found on the left-hand side of the dashboard provides quick access to all major functions, and its particularly clean layout offers step-by-step guides when addressing performance issues. 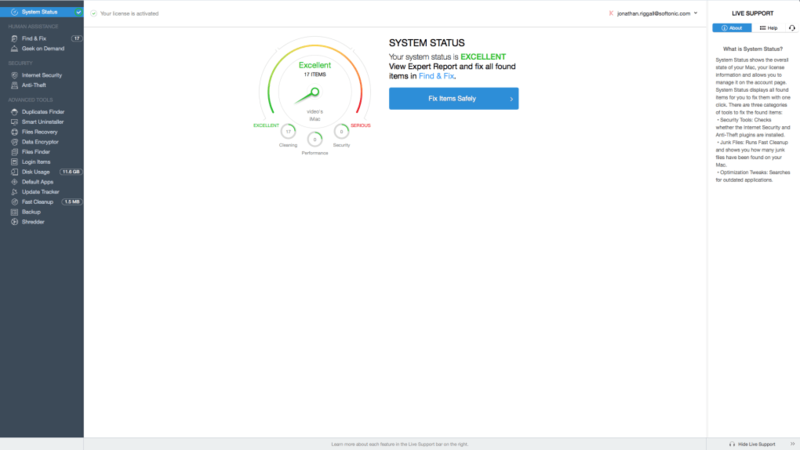 From this centralized portal, users can run safe cleanups, find duplicate folders, uninstall specific programs, monitor Internet security issues, and much more. Whenever users want to run MacKeeper, they can find the handy icon on the primary toolbar. Many software bundles which claim to speed up existing operating systems actually slow it down as a result of clumsy architecture. In contrast, the memory footprint associated with MacKeeper is quite small. Consequently, users should not be plagued by sluggish performance when this program is running. 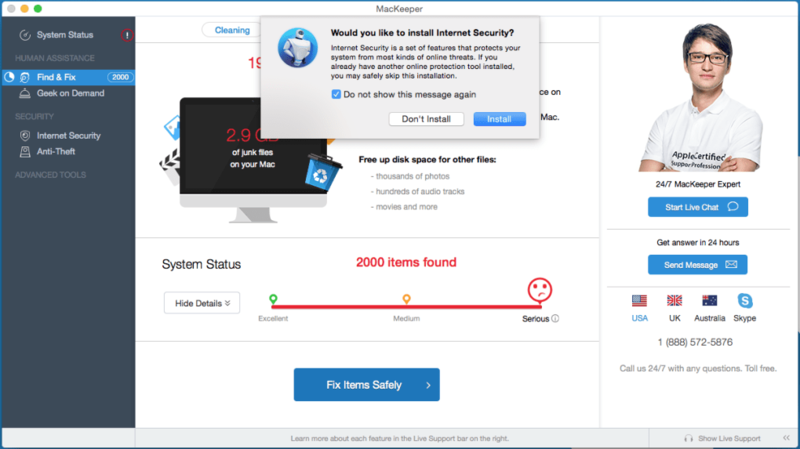 Notwithstanding the performance-boosting features this app runs, there are a number of security and privacy concerns that can be addressed using MacKeeper, including a secure VPN, online threat management, and a handy tracking feature which can be used in the event that the computer itself is stolen. While no free version is available, there are four different pricing plans to choose from. Plans can be purchased for a single month, six months, 12 months, or 24 months. Longer prepaid plans are associated with lower monthly rates. You don’t need a brand new Mac to have it feel like new. You just need the right optimization tool. MacKeeper cleans everything that prevents your Mac from being fast: junk files, useless local mail attachments as well as unnecessary file copies that take up hard drive space. This tool also can stop common memory-intensive processes that bog down your Mac. Built-in antivirus and adware cleaner protect from viruses and malicious programs that display unwanted ads. 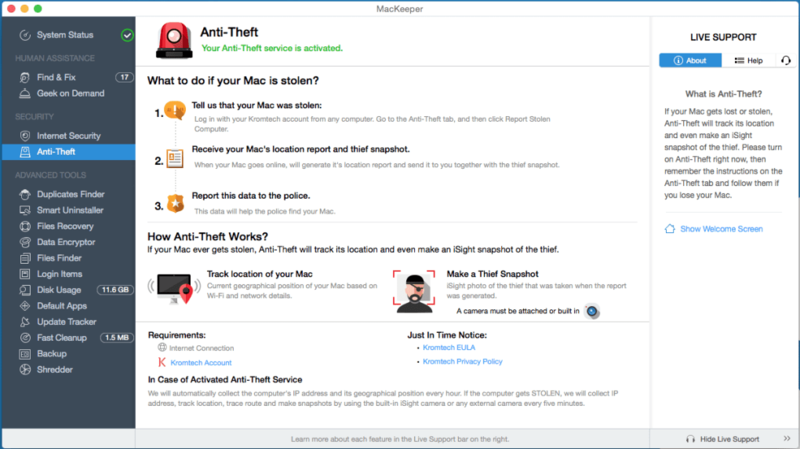 In case of theft, MacKeeper can track your Mac location, take a snapshot of the suspect, and lock the device to protect your data. 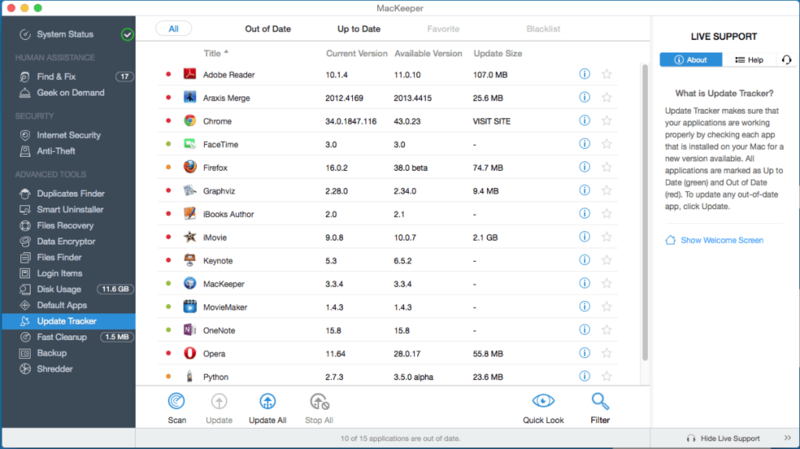 MacKeeper is your personal control center for your Mac. There’s no need to overcrowd your device with different apps. 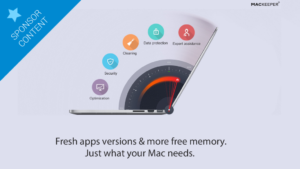 Short on time and want your Mac to be fixed in minutes? 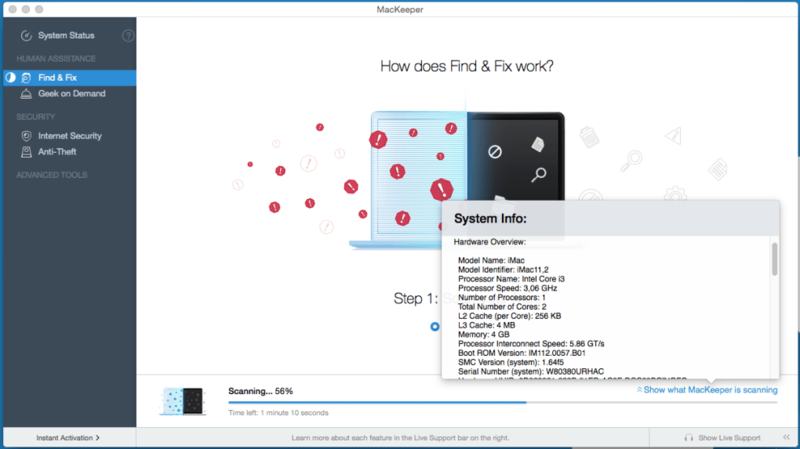 Try MacKeeper Find & Fix. It scans the whole system, finds security and performance issues, and fixes them in a click. Click to drill down—get the details about scan results with a simple scroll. 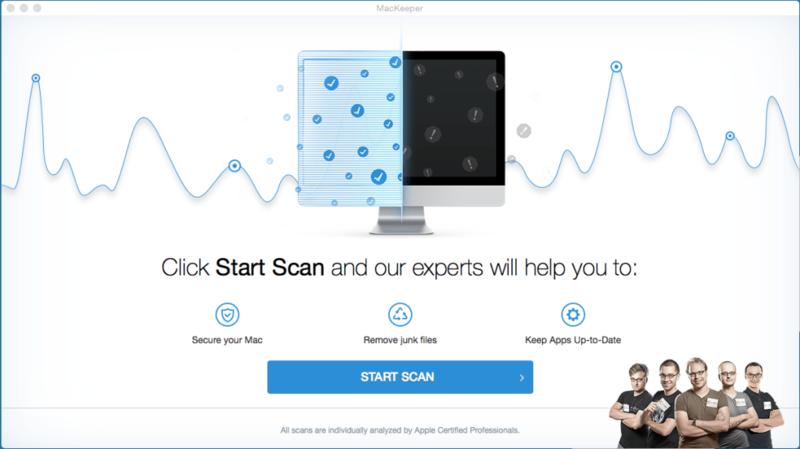 MacKeeper can quickly scan and fix 90% of your Mac issues. For the remaining 10%—your personal Apple Certified Support Professional assistant is ready to help. You don’t need to call support or wait for an email response. Use our in-app chat to get assistance—and enjoy your like-new Mac. Tested anti theft feature. 16 useful tools in one app. Tested anti-theft tool. Received customer support callback in several hours. Now I am sure my computer is protected. nice and professional tech support team. Keeps my Mac clean and safe. All in one. Just like swiss army knife. Cleans and protects my Mac. Easy to use and good tutorials. Pros: Cleans and protects my Mac. Helped me to remove duplicates. 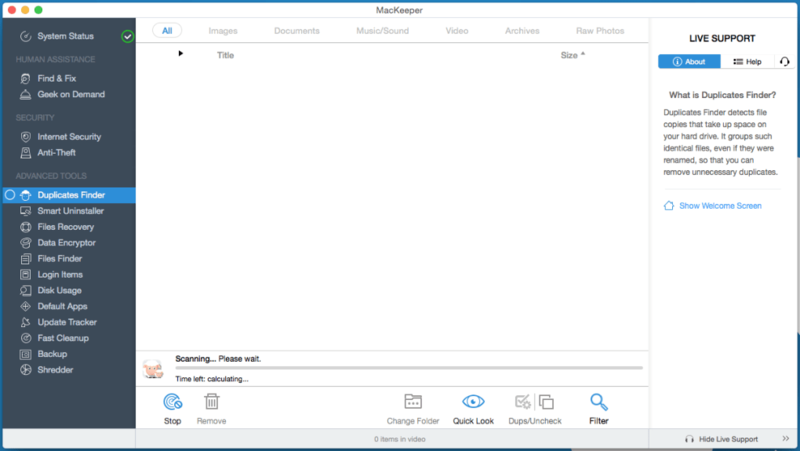 Encrypted my files with Mackeeper. So far only positive experience.. Good product for reasonable price. All you need in one application, Tech support on the high level. Enjoyed the conversation and Eugene was really helpful. I recommend it. Worst software you can put on your Mac.. Mackeeper killed my internet connection, basically. After uninstalling I looked at the Mac forum and found many other similar complaints against it. So far, so good. I like this app, it helps to manage huge number of files on my Mac and keeps it safe online and offline.